If you suffer from back pain while playing then this could be a real help. But proper advice and practice will always be the best way to improve your playing position. Will help to promote better playing posture. Offers little lower back support. Can feel restrictive. Just as an incorrect grip on the sticks can lead to wrist problems, sitting incorrectly at your drum kit can lead to excruciating back and shoulder pain which can limit or even end your playing career. Of course, the best way to nip these problems in the bud is with a good teacher but sometimes we're all guilty of bad habits and need a helping hand to put things right. 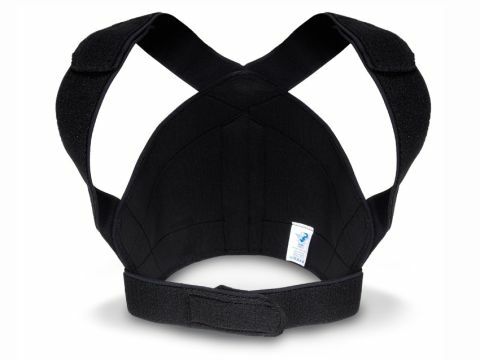 The Perfect Posture back support brace is made from a breathable elasticated Neoprene-like material that they call Air-X, with six wide, elasticated Velcro straps situated at strategic points to help secure the brace snugly to the wearer. Two one-inch stiff inserts are held in place vertically from the base of the support either side of where the wearer's spine would be - to add upper back and shoulder support. These are contained within the material of the support, presumably made from plastic (as the brace is washable at 40°). All external seams are covered with a soft material to ensure the wearer's comfort, and the Velcro straps are backed with a super-soft material as well. Feeling a little odd, we prepared to strap ourselves into the brace, but realised that our test-subject was broader-chested than the 38" medium was designed for. Nevertheless, our intrepid reviewer persevered, much to the amusement of their bandmates. Whilst not doubting Perfect Posture's claims that the brace is comfortable enough to wear under clothing, we opted to take their advice and wear it over a T-shirt - as they recommend for the first few times. Something worth considering size-wise if you decide to take the plunge. Straight away, the effect of the brace was apparent - it forces you to sit more upright and pulls your shoulders back and, if you wear a jacket with it, looks like you're wearing a shoulder holster! However, it offers little support to the lower back, so doesn't prevent you leaning forward when playing. The straps around the arms tended to feel restrictive after extended playing, although this is most likely as a result of our issues with the size. The Perfect Posture back support brace is marketed at a large range of people and for an array of uses. If you suffer from pain caused by imperfect posture whilst playing then it may help promote better posture, just be careful to select the right size initially. However, whilst it may be a useful aid, nothing beats proper prevention, so taking advice from a reputable teacher can help you adjust your set-up to alleviate any niggles you may be experiencing.